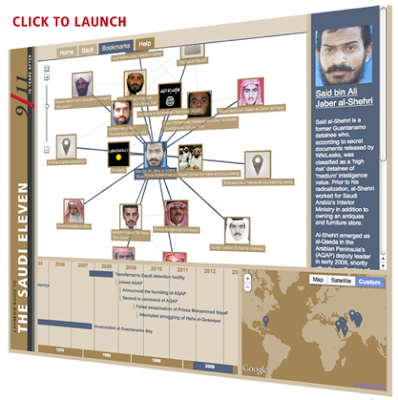 Christopher Boucek of the Carnegie Endowment for International Peace (Middle East Programme) has just released a very insightful interactive guide to the 'Saudi Eleven' - a group of Saudi extremists that share a very similar story. They were all detained in Guantanamo Bay, upon repatriation to Saudi Arabia underwent rehabilitation in the Prince Mohammed bin Nayef Center for Care and Counselling (a Saudi counter-radicalisation and counter-terrorism facility outside of Riyadh), subsequently fled to Yemen and joined the Al Qaeda in the Arabian Peninsula (AQAP). Much of the information that led to the compilation of this guide comes from the recently released Wikileaks cables that allow us to see the patterns of behaviour, ideology, ways to radicalisation and eventually all the terrorist activities associated with such a group of extremists. It's certainly a very insightful piece of work.